Traditionally, Wassail celebrations took place around 17th January (old Twelfth Night), toasting apple trees in orchards to encourage them to produce a plentiful harvest later in the year. 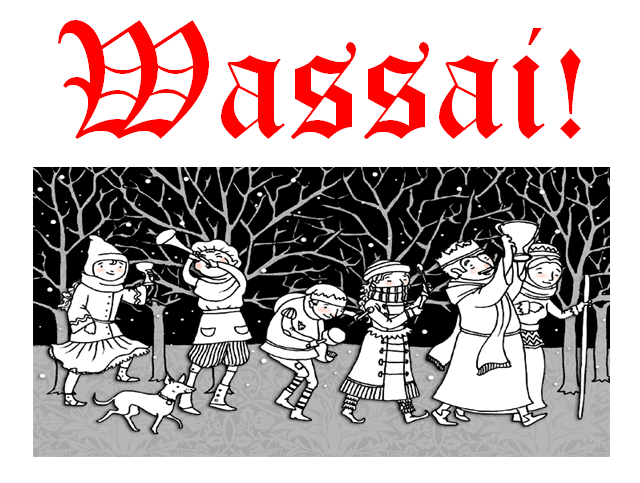 Wassail is from the Anglo Saxon 'Waes Hael', meaning 'to be healthy! Cider is offered to one of the largest or most prolific apple trees in the orchard, being poured over its roots. Pieces of cider-soaked toast are placed amongst the branches for the birds, guardian spirits of the tree. There is usually a bonfire, ribbons and garlands to decorate the trees. Visitors are encouraged to bring musical instruments and loud voices, pots, dustbin lids, pans or anything else to make a loud noise and sing, dance and make merry around the bonfire! You are welcome to bring your own pots/pans - anything to make a noise! Paul and Dawn will be providing a special Apple themed two course meal for just £10 (children half price) at the Stags Head Inn. Booking advisable, telephone 01963 440393. All proceeds in aid of Wincanton Hospital. Organised by Brue Valley Rotary Club, www.bruevalleyrotary.org.